Analyst Katy Huberty with Morgan Stanley issued a note to investors Friday stating that she is bullish on the prospect of improved future iPhone sales in China. This week, Apple executive revealed that more than 200,000 iPhones have been activated since the handset launched on carrier China Unicom last fall. Huberty noted that the current install base of unlocked iPhones in China is about 2 million, according to a new study conducted by Morgan Stanley. That is already similar to the largest European and Asian countries. Apple has a total addressable market of 50 million Chinese consumers, Huberty said, and the survey indicates Apple could, in time, sell between 4 and 5 million iPhones in China each year. Though 50 million consumers represents only about 4 percent of China's total population, it's comparable to major markets such as the U.K., which has 76 million subscribers, and Spain, with 53 million. In addition, the study found that introducing a lower-cost, prepaid device could increase iPhone sales by 100 percent, to as much as 10 million per year. "It's no surprise that pricing is the largest obstacle to greater iPhone adoption in China," the note reads. "Hardware pricing, service plan pricing and the large up-frot payment were cited by 85%, 66% and 56% of respondents respectively, as reasons they were not likely to purchase an iPhone." Based on the 200,000 units already sold through China Mobile, Apple is expected to sell about 1.2 million units in the iPhone's first year. Huberty expects those sales to skew higher as the year progresses, though, thanks to a joint marketing campaign and a 46-city road show to demonstrate the iPhone that began in late 2009. As for the 2 million iPhones already in the country, sales on the grey market are said to range in price from $550 to $820, mostly from Hong Kong. Most of the iPhones in China come from the grey market, thanks in part to the China Unicom model lacking Wi-Fi. The Morgan Stanley survey queried 1,050 consumers in China to determine underlying iPhone demand. The study targeted people who lie in China's "core iPhone addressable market." When it debuted last October, iPhone sales added just 5,000 subscribers to China Unicom. This week, Apple executives said they are, at the moment, more focused on building the Apple brand than they are unit sales in China. "We are very, very focused on the quality of the point of sale and consumer experience," said Tim Cook, Apple's chief operating officer. "We would prefer to move slow because we are building the brand for the long-term and we are very much focused on the long-term in that market, because we think there is significant potential there." There's no need to do anything particularly special for the Chinese market. As long as Apple maintains the constant development push and the Apple brand values are maintained, China is a market that will eventually come to Apple. 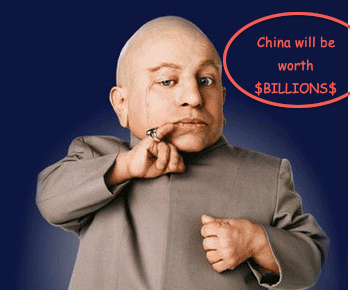 If Apple is still going strong in 10 years, China will be worth billions to it. ... If Apple is still going strong in 10 years, China will be worth billions to it. With this statement alone. Which is a very noteworthy comment, that tells us Apple main number one hurdle in china is the chinese government. The chinese government needs to break the ways that have bound its people for centuries. Communism must die, and the chinese people need a symbol to show them that light just may be on the horizon after all. A symbol from west..... and what other symbol could their be!? Not the american flag .... 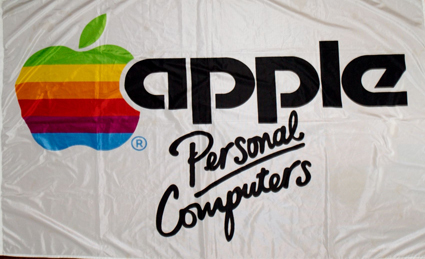 But the Flag of Apple, arriving with a simplistic, minimalistic & innovative approach to liberate the chinese and to show their government the error of there ways. ...and could even double that if the company were to offer a lower cost prepaid model. And could triple it if they offered a Wifi enabled version. But the Communists won't allow it. But hey, the grey market is filling the gap nicely at 2,000,000 jail broken iPhones and millions of pirated apps. Too much koolaid there MobileMe..and the colors...ouch! Let me know when you tone it down. Apple needs to have a stripped 4-8MB 3GS with WiFi unlocked version for the mass market at an affordable price like $350-400 and still keep its gross margins %. Great for the gray market in places like China, India, etc. Folks can get their own cheap GSM card and use a lot of the functions. I know there are reasons why they are not being aggressive about pricing... like protecting China Unicom so as encourage network expansion for data, etc. Just my guess. Again, Apple does not want to fall in the commodity trap. Word! It's interesting how human nature seems to make every economy/society react the same way, at least when it comes to technology as a status symbol. if this rumor is true. This might be one way to head off the FAKES ~ Famous brand stores such as Carrefour sell fake iPhones, I looked at one last week. When I pointed out that it was a fake to the woman behind the counter she disagreed, asking price 5000 Yuan, about $730.00 - you'll see fakes at many name brand stores not just Carrefour. I used to get these fakes offered to me on the street for 500 Yuan, about $73.00 but since the iPhone has landed they ask as much for fakes as real ones. How can you deal with a gov't that won't enforce intellectual property, copyrights or anything else related to consumer protection? I wonder how many people who bought fake iPhones think that the Apple brand is no good? it's comparable to major markets such as the U.K., which has 76 million subscribers, and Spain, with 53 million. Someone, somewhere has got their figures a little mixed up. There surely can't be 76 million subscribers in the UK when the population has only managed to reach approx 62 million. That number can't even be potential subscribers unless every adult and child of suitable age has 2 of them each! Many countries do have over a 100% penetration rate. The UK is one of them. Once again, Huberty proves she has no understanding whatsoever of Apple's long-term strategy or consumer appeal as aspirational products. Does she really have any credibility with investors? If so... why? 10M iPhones and how many clones?